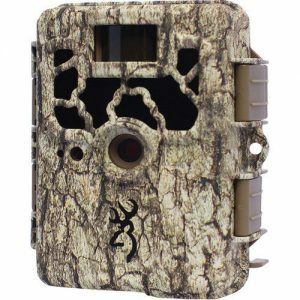 The Browning SPEC OPS 10MP Trail Camera is on sale for $99.99 at Walmart.com. The Spec Ops trail camera has a 2″ Color LCD screen for camera set-up, which works great for making sure the camera is aligned properly when hanging it. This game camera has a blazing fast .67-second trigger speed and anti-blur technology for night-time pictures. It has a black flash that will reach up to 70-feet with a 45′ detection range. One unique feature is that it will take up to 2-minute videos. Unlike a lot of lower end cameras, this trail camera will display date, time, moon phase, and temperature to help pattern game. This isn’t the best price I’ve ever seen on this camera but it is currently the price that I can find online and I’ve heard great things about it! Also, now would be a good time to cash in those Walmart gift cards! Full 1080p video with sound.